This basic design by Boeing initially began a conventional design in the mid-forties with the wing in the traditional straight wing manner. However word spread about the German ME 262 that had a swept wing, soon this aspect was looked into and the B-47 became one of the first American aircraft with swept wing. It became the trade mark for Boeing’s future development of B-52, B-707, B-727 and all future aircraft both Boeing and non-Boeing. The B-47 was described by some observers as “sleek, a beautiful outcome that was highly advanced” with the 35 degree swept wing made very aerodynamically “clean”. During its’ test phase, Chuck Yeager noted that fact, that the aircraft was so clean he trouble slowing it enough for landing. It took a little practice to master the right technique. Although there were only 3 crew members, they were very busy. The co-pilot doubled as co-pilot and tail gunner while the navigator also served as the bombardier. The pilot, being the commander, was the overseer of all operations of the aircraft. Interesting to note that the canopy could slide forward, but the crew entrance was with a door and ladder in the underside of the nose of the aircraft. Early jet engines did not develop good thrust at low speeds so a RATO* (later on called JATO) system was developed to assist a fully loaded B-47 take-off. The rocket assist take off consisted of 18 solid state rockets used for take-off assist. Because the aircraft was so aerodynamically slick, drag had to be introduced to slow it down. 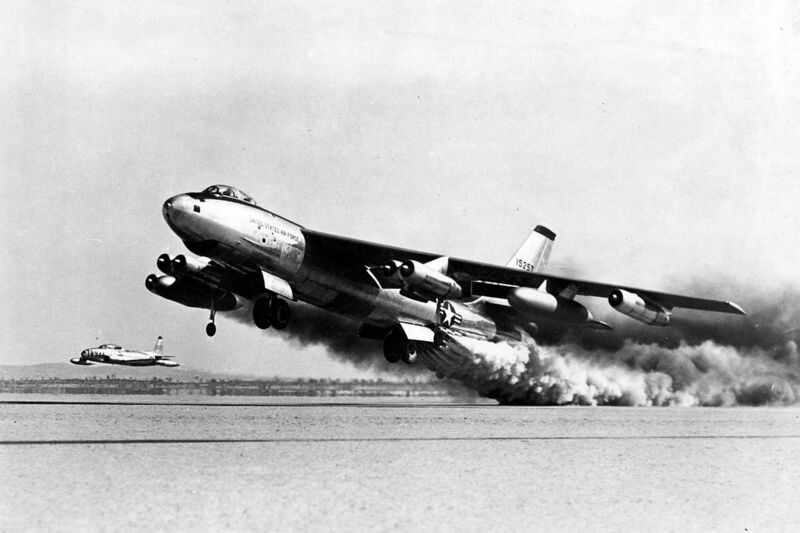 The B-47 landed at a high 180 kts (compared to about 135 kts for modern airliners). So a drag chute was deployed after touch down which slowed the aircraft, much like the “chutes” that slow the Apollo Spacecraft after it entered the earth’s atmosphere and is slowed down for it’s final descent into the water. The second use for the drag chute, was that the jet engines of the day were very slow to “spool”, that is to develop full power. It took about 16 seconds to go from idle power to full power. In a go-around situation that may be way too long. So the chute was deployed before landing and full power was on the throttles. This was an added feature for training for “touch and go” landing practice. The B-47 was USAF/SAC primary nuclear deterrent bomber from the early 1950’s until about 1959 when the B-52 started taking over. RB-47 worked as recon aircraft until 1967. 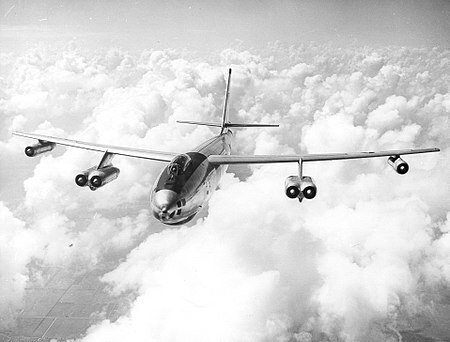 As the B-52s were deployed as SAC’s primary high altitude nuclear deterrent, the B-47 was used as a low level, “under the radar” attacker. It would fly (in strategic theory) under the enemy’s radar, then just before reaching the target “pop-up” to much higher altitude (to avoid the blast) and deliver a nuclear weapon. In 1958 a B-47 was involved in an exercise with an F-86 fighter near Savannah GA. The two aircraft collided, the pilot of the F-86 bailed out successfully, the B-47 was substantially damaged but was able to make 3 non-successful approaches at Homestead AFB in Florida. The Stratojet was carrying a non-armed Mark 15 Nuclear Bomb. It was decided to drop the Mark 15 nuclear devise near Tybee Island off the coast from Savannah. The Mark 15 was jettisoned safely and the aircraft landed safely. Despite a search for nearly a year (9 months), the Mark 15 was never recovered. In 1954 a RB-47F few a Top Secret mission from England over Sweden for recon work over the USSR. U.S. intelligent thought that the Soviets only had Mig-15s in the area at that time. Unbeknown to them, there were Mig-17s stationed at the Soviet base. The Mig-17 was faster and could fly higher then the Mig-15. So the race was on, the RB-47 heading back to England and the Mig-17’s trying to shoot it down. The RB-47 won out with superior speed and altitude but was shot up. This was the first time an American aircraft was able to photograph an enemy installation (non-U2 aircraft). 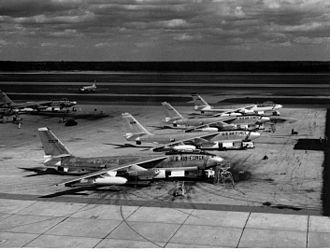 On 10 March 1956, Four B-47 Stratojets took off from McDill AFB FL for a flight across the Atlantic to Ben Guerir Air Base in Morocco. The first refueling was without incident. The second refueling required the flight to descend to 14,000 ft in cloud cover. Three of the aircraft rendezvoused with the tanker ok, but the fourth was never heard from again! On 27 July 1956 at RAF Lakenheath a B-47 was making an approach to the landing runway. The aircraft veered off the approach and slammed into an igloo storage building containing MK-6 Nuclear Devises. The weapons did not have fissile cores installed. But it did have about 8,000 lbs of high explosive triggers. The ensuing fire did not set off the triggers, although the crew perished. On 04 Apr 1959, a B-47 crashed into the Santa Rita Mountains South of Tucson near Green Valley AZ. The aircraft had been attempting an approach to Davis-Monthan AFB in Tucson. The crew was lost and the investigation revealed an faulty altimeter on board the airplane was responsible for the accident. 20 February 1963 a “line B-47” from Lincoln AFB NE was practicing a bombing exercise near Comfrey MN when something went wrong and it crashed into a field near the town. One of the engine’s had failed and apparently the aircraft was low and slow with those under powered engines, it couldn’t recover in time. There were no survivors. Engines: 6 GE J35 turbojets with RATO*. Thanks for reading this article. I hope it was informative.